A male House Sparrow in Hungry Hill, Northrepps (East Norfolk)..
...and the male 'Italian' Sparrow currently residing at 27 Hungry Hill. 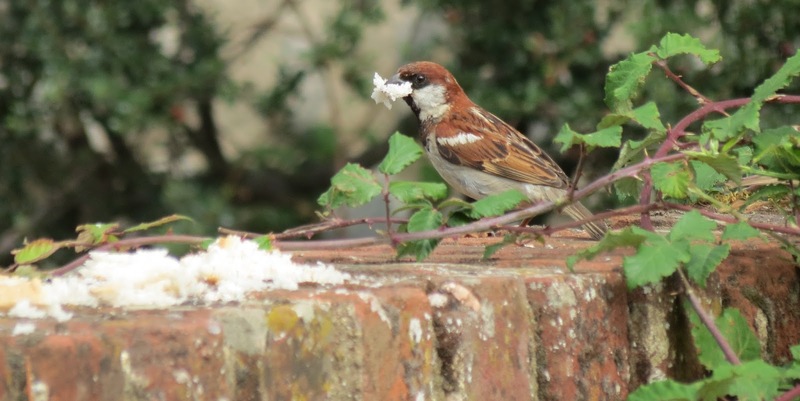 I was struck at how big and bulbous the bill looked compared with the male House Sparrow's - a feature I noted from Italy - and although this male is missing the characteristic hint of a superciliary, it certainly bears a chestnut crown, very white cheeks and paler 'tramlines'. The Italian Sparrow occurs in northern and central Italy. 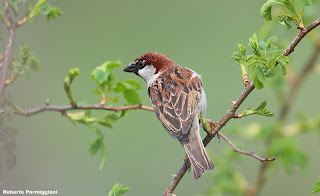 In the north of the range, it forms a narrow zone of intergradation with House Sparrow, from about Imperia in the west (following a broad arc along the Alps) to Monfalcone in the east. South of Naples, there is an extensive clinal zone of intergradation with Spanish Sparrow, extending through southern Italy to Sicily and Malta. Post-breeding movement/dispersal of the northern population has been noted in southern France and Austria, whilst Italian Sparrows seem to breed widely on Corsica. Hermansen, Jo S.; Sæther, Stein A.; Elgvin, Tore O.; Borge, Thomas; Hjelle, Elin; Sætre, Glenn-Peter (September 2011). 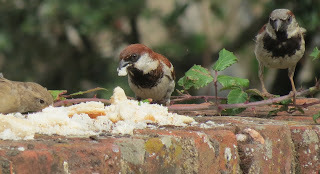 "Hybrid speciation in sparrows I: phenotypic intermediacy, genetic admixture and barriers to gene flow". Molecular Ecology 20 (18): 3812–3822.